Hercules arrived to Back to Nature in December 2006. He was found wandering in Seminole County and brought in to be identified by a private citizen. The staff of BTN instantly knew he was not a native gopher tortoise upon initial examination due to his brightly colored feet and oddly shaped shell. Hercules was later identified as an exotic South American Red Footed Tortoise. He was assumed a pet that either escaped from his enclosure or was simply released into the environment as a “throw-away pet”. Upon housing Hercules in search of his owner, no inquiries were made to BTN regarding a missing pet tortoise. He was shortly thereafter, deemed a permanent resident of BTN. Hercules now lives at Back to Nature to serve as an “educational ambassador” for his species and the exotic pet trade. 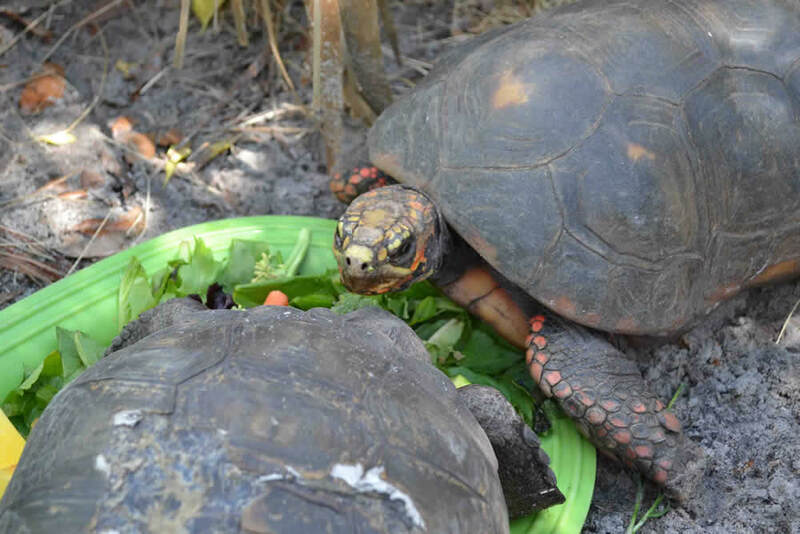 The Red foot tortoise (Chelonoidis carbonaria) are popular pet tortoises from northern South America. They are medium-sized tortoises that generally average 30 centimetres (12 in) as adults, but can reach over 40 cm (16 in). They have a dark-colored loaf-shaped carapace (back shell) with a lighter patch in the middle of each scute (scales on the shell), and dark limbs with brightly colored scales that range from pale yellow to dark red. There are recognized differences between red-footed tortoises from different regions. 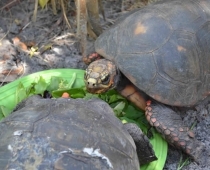 They are closely related to the yellow-footed tortoise (C. denticulata) from the Amazon Basin. Their natural habitat ranges from savannah to forest-edges around the Amazon Basin. They are omnivorous with a diet based on a wide assortment of plants- mostly fruit when available, but also including grasses, flowers, fungi, carrion, and invertebrates. Eggs, hatchling, and young tortoises are food for many predators but the main threats for adults are jaguars and humans. Population density ranges from locally common to very scarce due in part to habitat destruction and over-collection for food and the pet trade.